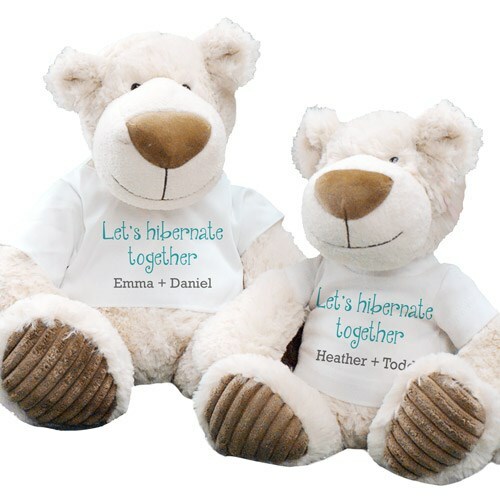 Our “Let’s Hibernate Together” design is featured on your choice of our our 12” or 15" Latte Teddy Bear. Featuring the classic Aurora plush style, Latte is a smiling bear with a modernistic, oversize nose. His cream color exterior is enjoyably soft and the corduroy pads on his plush feet offer a velvety texture. He wears a t-shirt that may be personalized for free with any two names. Free gift wrapping and a free gift message are also included to create a thoughtful presentation. Very nice product, you should include more designs for personalizing the t-shirts the animals/ bears wear. Additional Details Find more great Wedding Bears and Romance Plush for your loved one at 800Bear!